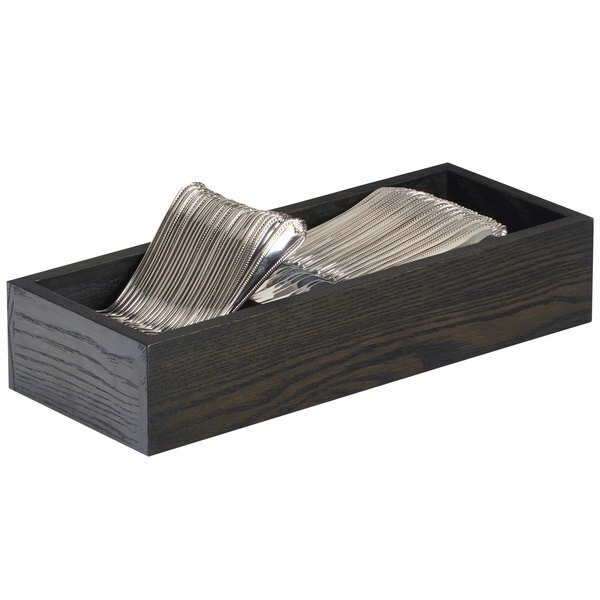 Cal-Mil 3819-87 Cinderwood Two Compartment Oak Wood Flatware Organizer - 15 1/8" x 5 1/2" x 4 3/8"
Keep your flatware or packaged condiments separated for easy identification and selection with this Cal-Mil 3819-87 Cinderwood oak wood two compartment flatware organizer. Coming with two sections, this organizer allows you to provide guests with forks, knives, or spoons that are easily accessible. For added convenience, this organizer can also be used to hold stirrers, creamers, or sugar packets at your coffee station. The open, curved design notifies staff when refills are necessary, promising your guests never run out of their necessary dining tools or favorite condiments. Constructed of durable Cinderwood stained wood oak, this organizer provides a natural appearance that's great for vintage-themed venues and bed and breakfasts. Add a modern rustic touch to your cafe, hotel, or lounge with this Cinderwood organizer! Cal-Mil 3802-87 Cinderwood 3 Section Flatware Organizer - 13 3/4" x 10" x 6"
Cal-Mil 3800-6-87 Cinderwood Ice Housing with Polycarbonate Pan - 7 1/2" x 7 1/2" x 7"
Cal-Mil 3800-12-87 Cinderwood Ice Housing with Polycarbonate Pan - 21 1/4" x 13 1/4" x 7"
Cal-Mil 3805-87 Cinderwood Six Jar Condiment Organizer - 12 3/4" x 9" x 5"
Cal-Mil 3828-87 Cinderwood 8 Qt. Full-Size Chafer with Stainless Steel Lid, Fuel Holder, and Easy Access Drawer - 22" x 14" x 13 1/2"
Cal-Mil 3813-87 Cinderwood Chafer Alternative with Grill Top and Fuel Holder - 19 3/4" x 10" x 5 1/2"
Cal-Mil 3800-10-87 Cinderwood Ice Housing with Polycarbonate Pan - 13 1/4" x 11" x 7 1/4"
Cal-Mil 3814-87 Cinderwood Chafer Alternative with Grill Top and Fuel Holder - 10 1/4" x 10" x 5 1/2"
Cal-Mil 3816-87 Cinderwood Oak Wood Butane Burner Frame - 14" x 12" x 7 1/2"
Cal-Mil 3806-87 Cinderwood Three Jar Condiment Organizer - 12 3/4" x 5" x 5"
Cal-Mil 435-11-87 Cinderwood Hexagon Oak Wood Riser - 12" x 11"
Cal-Mil 3822-6-87 Cinderwood Marble Riser - 15" x 11" x 6 1/4"
Cal-Mil 435-8-87 Cinderwood Hexagon Oak Wood Riser - 12" x 8"
Cal-Mil 3822-13-87 Cinderwood Marble Riser - 15" x 11" x 13 1/4"
Cal-Mil 3822-9-87 Cinderwood Marble Riser - 15" x 11" x 9 1/4"
Cal-Mil 435-5-87 Cinderwood Hexagon Oak Wood Riser - 12" x 5"
Cal-Mil 3820-87 Cinderwood Four Compartment Oak Wood Bread Case - 20" x 13 1/2" x 15"
Cal-Mil 3815-87 Cinderwood Three Tier Oak Wood Vertical Bread Case - 13" x 6 1/2" x 20 1/4"
Cal-Mil 3804-3-87 Cinderwood 3 Gallon Beverage Dispenser with Ice Chamber - 8" x 8" x 26"
Cal-Mil 3823-87 Cinderwood 3 Compartment Dark Oak Wood Cereal Dispenser - 17 1/2" x 9 1/2" x 24"
Cal-Mil 3804-3INF-87 Cinderwood 3 Gallon Beverage Dispenser with Infusion Chamber - 8" x 8" x 26"